During your office visit, you'll receive professional, prompt service focused on you. The following steps will give you an idea of what to expect. Understanding more about your lifestyle and hearing priorities helps us provide individualized care. Are you outdoorsy? Do you frequent restaurants and public places? Do you enjoy television, music, movies and lectures? Do you work every day? All of these things and more play into the kind of hearing aids right for you. Answering a few short questions on the Personalized Hearing Health Assessment (PHAA), will get the conversation started. Use the link below to open the PHAA. When you're finished, simply print out the completed form and take it to your local Beltone Hearing Aid Center. Many people are surprised by how much our overall health—and the medications we take—can impact our hearing. Several common conditions can adversely affect our ability to hear. For example, high blood pressure, diabetes and kidney disease are all linked to hearing loss. Similarly, understanding your hearing history gives us a window into your ability to hear today. Is there hearing loss in your family? Are one or two ears affected? Were you subjected to chronic loud noise during your life? Do you have dizziness or vertigo? Did you have ear infections as a child? Is it harder to hear the voices of men, women, or children? Do you notice environments where it's challenging to follow the conversation? 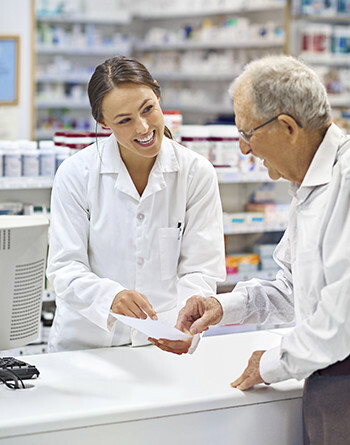 At this time, you will also be asked about any medications you take. This is important because many prescription and over-the-counter drugs are ototoxic, or harmful to your hearing. This is also the stage to mention anything else that relates to your hearing. A hearing “test” actually includes several tests that measure how well you hear a variety of sounds, such as tones and speech. A baseline hearing screening is recommended at age 50, unless you're experiencing symptoms of hearing loss sooner. After your evaluation, we'll show you your results on an audiogram. An audiograms provides a visual representation of the sounds you're hearing and the sounds you're missing. All Beltone practitioners strictly adhere to all federal, state and local regulations regarding hearing instrument dispensing protocols, and follow nationally accepted testing guidelines set forth by the American Speech Language Hearing Association, the American Academy of Audiology and the International Hearing Society. 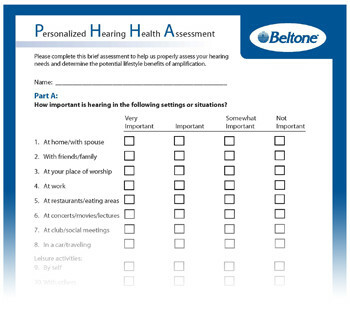 After your hearing evaluation, your Beltone hearing care professional will review your results on an audiogram. An audiogram is a visual representation of how well you are hearing. Hearing loss takes many forms. Some of us start missing sounds in the higher ranges, such as the voices of women and children. Others hear quite well in quiet surroundings, but struggle in noisy environments. Your audiogram shows you where you're hearing normally, and where you're missing sounds. 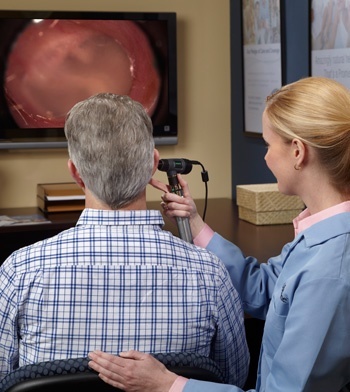 Once you and your Beltone hearing care professional discuss your audiogram results, and review your lifestyle and hearing goals, he or she can provide you with an in-office hearing aid demonstration of the hearing aids right for you, should hearing aids be prescribed. If a hearing loss is found, and hearing aids are recommended, you can “try before you buy” at Beltone. We'll show you the many styles of hearing aids right for you. You can try on actual hearing aids and take a “test drive”. That includes our latest Beltone hearing aids. 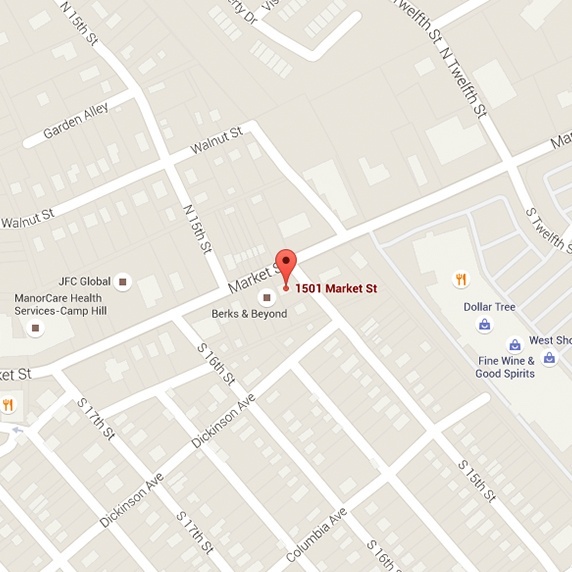 You can also experience our exclusive Beltone AVE.™ system. This surround sound technology simulates over 200 sounds of life while wearing hearing aids. Beltone AVE. also features the Hearing Loss Simulator, which allows loved ones to see what your hearing loss sounds like. Hearing your best is a personal matter. That's why the fitting process is interactive at Beltone. 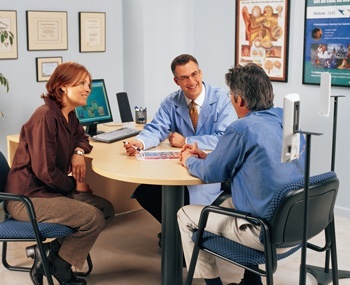 When we fit your new hearing aids, your thoughts and feelings guide the process, and your input shapes the outcome. 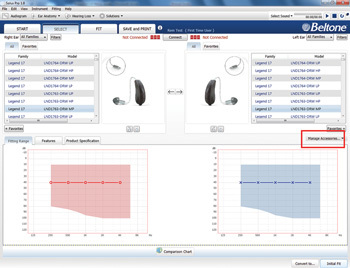 Based on your audiogram results, your Beltone professional will program your hearing aids to your specific hearing loss using our proprietary Solus™ fitting software. This software is patient-focused and allows you to be a pivotal part of the process. During the fitting process, we also review the many features your Beltone hearing aids offer to make your listening experience second to none. Adjusting to your new hearing aids can happen the moment you put them on, or take a few days.